"Our Brookfield, Wisconsin dental office provides family dentistry in a fun and friendly environment, attempting to make all dental treatments as comfortable as possible. We want our patients to enjoy optimal health starting with their smiles. Our dental office is dedicated to giving you the best service possible. At your first visit you will see me for a comprehensive exam and x-ray. 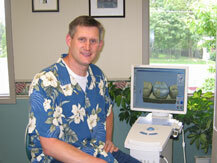 I will explain any necessary dental treatment and listen to your concerns as well. You will be scheduled for a future appointment with a hygienist and for necessary dental work with me. Children being seen for the first time at our Brookfield dental office will have an exam and cleaning at the same appointment."